My favorite part about the holidays, aside from spending time with family and friends, is gift giving. I’ve been keeping my eye out lately for potential gifts for cooks and other food lovers, clipping items from magazines, catalogs and websites, and I’ve compiled a list of what I believe to be 10 excellent gift ideas. Most items on the list are under $50 and all of them are under $100 – I’ve linked to the stores where you can purchase them. Happy browsing! This past summer, fans of Julia Child flocked to the theaters to see Meryl Streep portray the eccentric, legendary chef on the big screen. Now your foodie friends can laugh and salivate over the food all over again in the comfort of their own homes now that the DVD version is out, just in time for the holidays. 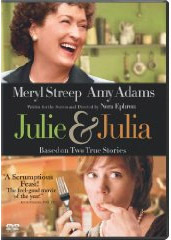 Buy the Julie & Julia DVD at Amazon. Gourmet girlfriends can channel their inner Bree Van de Kamp with these incredibly stylish hostess aprons. I gave one of these to my mother last year, they’re too cute. There’s a variety of styles to choose from – you just might pick up one for yourself too! 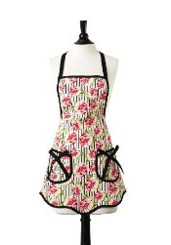 Browse the Jessie Steele apron styles at Amazon. I would be remiss if I didn’t include a panini grill on this list, wouldn’t I? As many of you know, I’m a big fan of the Breville presses (in fact, this blog was born after I first received the Breville Ikon as a holiday gift). They’ve got a new model out this year, called the Panini Duo Press. It’s a touch more compact than some of their earlier models, so you could actually keep this one on your counter all the time. See the Breville Panini Duo Press at Sur La Table. What cheese lover wouldn’t enjoy trimming their Christmas tree with Camembert, Gouda and Chevre? Sur La Table’s new handmade glass cheese ornaments from Germany look incredibly realistic and come in five varieties. 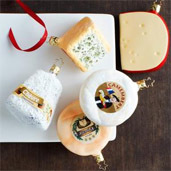 Browse the cheese ornaments at Sur La Table. Shopping for toddlers this year? 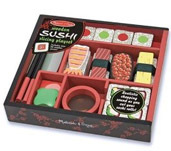 I’ve given this wooden sushi set from Melissa & Doug to about half a dozen of my daughter’s little friends this year – what a fabulous toy. The kids love to slice up the sushi rolls (and I love that everything stays nice and contained in its own little bento box). See this and other Melissa & Doug food toys at Amazon. Speaking of Julia Child…her revolutionary cookbook, Mastering The Art of French Cooking , is a must-have for beginners and seasoned cooks alike. Pair it with the Julie & Julia DVD (see above) or another generational favorite cookbook, Joy of Cooking: 75th Anniversary Edition , for a gift set your recipient is sure to treasure for years to come. Buy Mastering The Art of French Cooking and Joy of Cooking: 75th Anniversary Edition at Amazon. The thought of being able to showcase individual souffles, pot pies and molten chocolate cakes in these gorgeous limited edition mini Le Creuset pots is almost more than I can handle. They’re being sold right now with a bonus cookbook – a perfect gift made even more perfect. View the Le Creuset Mini Cocotte Sets on Amazon. I give at least one of philosophy’s yummy bath and body sets to someone on my holiday list every year. This year, ‘the holiday cookbook’ has caught my eye. It includes 6 recipe inspired shampoo, shower gel and bubble baths: red velvet cake, cinnamon buns, spicy pear cobbler, pumpkin spice muffin, gingerbread and double rich hot cocoa. That’s what I call a no-guilt holiday sweets splurge! 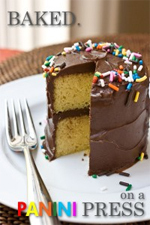 See ‘the holiday cookbook’ at Amazon. [DEAL ALERT: Enter code SHARE at checkout to save 80% on Dinner of the Month Club, thru 12/14/09] Who among us gets the chance to enjoy a nice dinner out as often as we’d like? With Restaurant.com’s Dinner of the Month club, you can send someone special a $25 dining gift certificate each month for 3, 6 or 12 months. A 3-month plan costs just $30 (a $75 value). To top it all off, you’ll receive a bonus certificate for yourself too. The certificates are accepted at over 13,000 restaurants nationwide so your recipient will be sure to find lots of delicious dining options to explore. View the Dinner of the Month plans at Restaurant.com. Ever since I first read about Sir Francis Bacon Peanut Brittle in the The New York Times a few months ago I knew it was going on my gift list. I know bacon is verging on being over-hyped, but it doesn’t change the fact that it tastes really good and sounds incredibly intriguing as a component in peanut brittle. I love to send gifts from Dean & Deluca, so family members watch out – some bacon brittle may be coming your way soon! Buy Sir Francis Bacon Peanut Brittle at Dean & Deluca. The Big Guide to Foodie Gift Guides – an enormous compilation of every foodie gift guide imaginable! Happy Holidays and greetings from Beantown Cuz. Great gift ideas Kathy! I’ll be trying the leftover turkey recipes this week. Loved the apple chutney. GREAT gift ideas Kathy!!!! I know Julie & Julia is on my “must have” list (tho I don’t think I’ll be patient enough to wait for the holiday) The LC idea – wonderful. .-= Lys´s last blog ..Holiday Online Shopping – Getting More Bang For The Buck… =-. 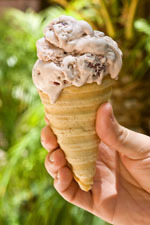 Thank you so much for the link back to Yummery! I certainly hope Santa grants all your holiday wishes this year. .-= Erin´s last blog ..Happy Turkey Day! =-. I just featured your list on our Big Guide to Foodie Gift Guides. Come check it out! If you like it, please share it with your social network (Foodbuzz, Facebook, Twitter, etc). .-= Nate´s last blog ..The Big Guide to Foodie Gift Guides =-. Wonderful give suggestions! I hope to find one or two under my own tree! .-= Natashya´s last blog ..Old World Rye Bread and a Great Canadian Giveaway! =-. I’ve been thinking I should do this recommendation thing on my blog as well. Hmmm… will have to think about it. Can you believe I haven’t seen Julie & Julia yet?? .-= Lori @ RecipeGirl´s last blog ..Holiday Appetizers: Margarita Shrimp Bites with Southwestern Sauce =-. Ooh good stuff here. Something I really want this year is a spiralizer! They look like lots of fun. And cookbooks, always cookbooks. Also a sharp knife. It seems as though many kitchens lack a really good knife. .-= Sagan´s last blog ..Day Eight of the 200 Reps Challenge =-.